The stream was a nuisance, frequently overflowing its banks. Between 1974 and 1997, the river was forced into a concrete channel and in some sections, completely concealed beneath the traffic. 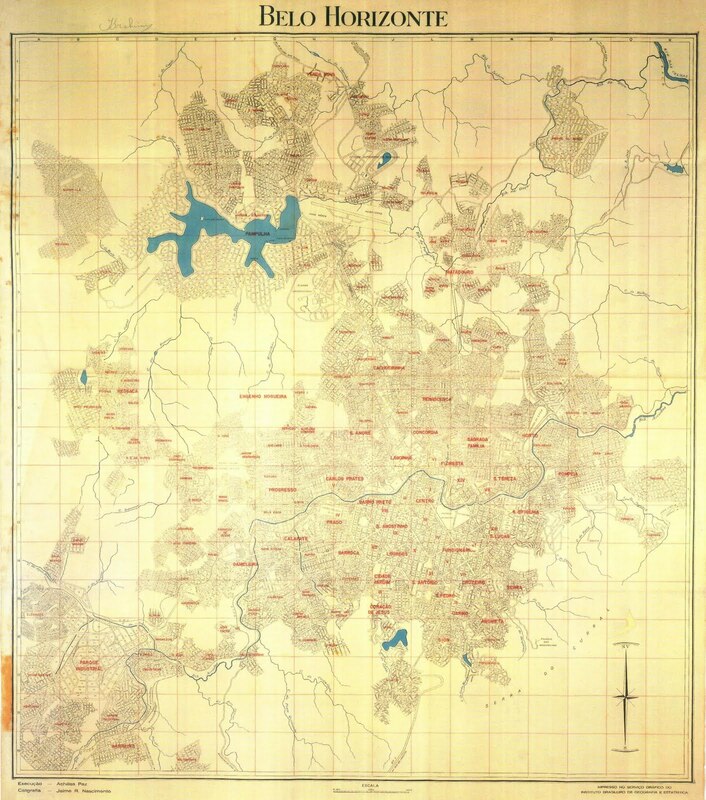 To get an understanding of how Belo Horizonte was intended to appear and what it became, the 1895 Aarão Reis plan shows a central park in the city’s urban heart, which was surrounded by a suburban district, and a rural district. The street layout was reminiscent of L’Enfant’s plan for Washington and Haussmann’s Paris. While the U. S. capital largely adhered to its intended grid, only a small portion of Belo Horizonte within the Avenida de Contorno followed Reis’ grid. The rest of the city laid out its streets independently within each neighborhood. Even its Municipal Park, inspired by French gardens, was only partially completed within its designated square. In the 1920s, the city began experiencing a rapid population increase as new neighborhoods appeared along old roads leading into the city center. During this decade, many of the smaller steams in Belo Horizonte were channelized and covered. Two local sons did not like seeing how the city was developing and sought to tame the growth and restore some of Reis’ vision for Belo Horizonte. Juscelino Kubitschek, a doctor who was elected mayor in 1940 led the effort to dam a creek on the city north to form Palpulha Reservoir, along with modernist structures around its shore by top architects such as Oscar Niemeyer and Roberto Burle Marx. After becoming president in 1956, Kubitschek and Niemeyer took the concept of a planned city deeper into the country’s interior with the new federal capital of Brasilia. His successor, Américo René Gianetti sought to create grids for new neighborhoods, as seen in the above 1953 plan. Throughout these decades, the Ribeirão Arrudas continued to overflow its channel, covering its historic floodplain. This mayor was memorialized in Municipal Park, which now carries his name. When the stream flooded, it made a mess of the city’s center, as a 1982 image above shows. The 1983 flooding photo above comes from the Curral Del Rei blog, which documents the city’s history, including its waterways. Scenes such as this one spoke of the public’s frustration with Ribeirão Arrudas and other local creeks that overflowed their banks, spilling their polluted water into homes and businesses. For nearly 14 miles (23 km. ), Ribeirão Arrudas is confined to a concrete channel that is exposed in some sections and covered in others. Entering the city from the southwest, it begins is channelized course to the east of the Cidade Industrial, following Teresa Cristina Avenue towards President Juscelino Kubitschek Avenue, a partial highway that is paralleled by a railway, north built along the course of the river. At the Carlos Prates station, Kubitschek merges with Contorno Avenue that encircles the Belo Horizonte’s city center. Above is a 1960s view of Avenida dos Andradas, which follows the river on the eastern side of the city center. In this section of Belo Horizonte, the water is out of sight, deep below the Central Station, Museum of Arts and Crafts, Rui Barbosa Plaza, Funarte cultural center, and the Municipal Park. In 1928, this section of the river was the first to be channeled, with Canal Avenue laid along its banks. The avenue was shortly thereafter renamed after the governor of Minas Gerais, Antonio Carlos Ribeiro de Andrada. The avenue’s plural name Andrades also honors his ancestors going back four generations. They shared his first and last name, and leadership in local and national politics. In recent years, the covering of Ribeirão Arrudas has continued with an expansion of public plazas on the median of Avenida dos Andrades. Looking at the view above, the Arrudas resembles the Ayalon River of Tel Aviv. As with Israel’s White City, the Garden City of Brazil has no plans to daylight or restore the natural course of its main waterway. Although less common nowadays, this river still has the ability to overflow its banks in very dramatic form, as seen here in November 2015. Ribeirão Arrudas flows out of the city into the Rio das Velhas, which itself is a tributary of the Rio São Francisco, meeting the Atlantic Ocean more than 2,600 miles downstream. In the course of my research on the Ribeirao Arrudas, most of the information I was able to find came from the work of Alessandro Borsagli, who wrote two books on the subject: Rios Invisíveis da Metrópole Mineira (Invisible Rivers of the Mining Metropolis), published earlier this year, along with its companion map guide that includes before and after images of the river being hidden. 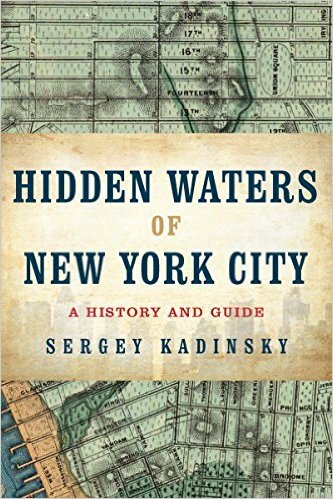 With his blog, book, and published articles on hidden urban streams, blending history, maps, and current conditions, Alessandro Borsagli is the Sergey Kadinsky of Belo Horizonte. But my interest in Belo Horizonte relates to another published author, Alexander Birbrair, a molecular biology researcher who was recently hired by the Federal University of Minas Gerais (UFMG) in Belo Horizonte to conduct research and teach. After receiving his doctorate here in the states, he’s going back to Brazil. “Strange as it may seem, it was a very easy and logical decision for me.” I’ve known Birbrair and his wife Veranika for nearly three years and will miss them once they leave New York for Brazil. Looking at Belo Horizonte, I hope to visit him, meet my counterpart Alessandro Borsagli, and perhaps inquire with the city’s Parks Department about work opportunities. The largest city in Brazil, Sao Paulo, has its own collection of hidden waters, which are documented on this site. Staten Island Advance looks at the history of Prince’s Bay, a waterfront community on its south shore. Architects Newspaper reports on the expansion of parkland in Houston, including the waterfront Sabine Promenade and Buffalo Bayou Park. CityLab reports on one group’s effort to map all 45 of Mexico City’s hidden waterways. Have you read about the Piedad River? Buzzfeed reports on one man’s plunge into a pond in Brooklyn’s Prospect Park while virtually hunting for Pokemon.